Anti-Israel extremists attempt to violently break up march in solidarity with three kidnapped teens; at least one arrest. Footage from Paris shows the moment pro-Israel march came under attack by anti-Israel extremists. The rally was held to call for the release of three Israeli teenagers kidnapped by the Hamas terrorist group. People can be seen first fleeing the attack - which involved flares being hurled at Israel supporters - and then surging back to chase the attackers. Police intervened, however, and can be seen making at least one arrest. 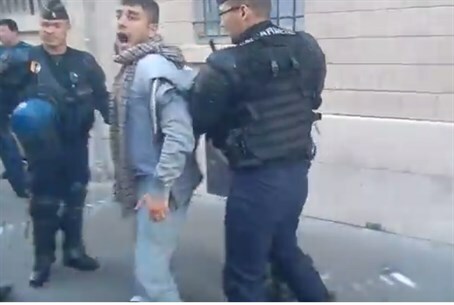 Violent anti-Semitism in France is a growing problem, with many Jews there unable to publicly display their Judaism or support for Israel for fear of coming under attack. The success of the far-right National Front party, coupled with the rise of militant Islam in the European country - which has the largest Muslim population of any non-Muslim country - has alarmed the French Jewish community, with increasing numbers turning to self-defense initiatives or leaving the country altogether as authorities stand accused of not clamping down on anti-Semitism.